Thomas Mueller picked up where he left off at the World Cup, scoring a hat trick in Germany's 4-0 victory over 10-man Portugal in the Group G opener on Monday. Mueller scored five goals at the 2010 World Cup, along with three other players, but he also had three assists and that gave the Bayern Munich forward the honor of top scorer in South Africa. "To score three goals in the World Cup opener against such an opponent is great," Mueller said of his performance against Portugal, which was outclassed despite the presence of Cristiano Ronaldo. Mueller opened the scoring with a penalty in the 12th minute and, after Mats Hummels' headed goal in the 32nd, virtually put the match away by adding another shortly before halftime for a decisive 3-0 lead. Mueller added his third in the 81st. "He is such an unorthodox player, as a coach you never know what he is about to do," Germany coach Joachim Loew said of Mueller. "For opponents, he is very unpredictable, he only has one thought on his mind and that is to score a goal." Ronaldo, Portugal's star striker and FIFA's world player of the year, threatened a few times early in the match but remained largely ineffective. He had been doubtful before the match because of a left-knee injury. Loew commended his players for cutting off Ronaldo's supply of possession and keeping Portugal's key player out of the game. 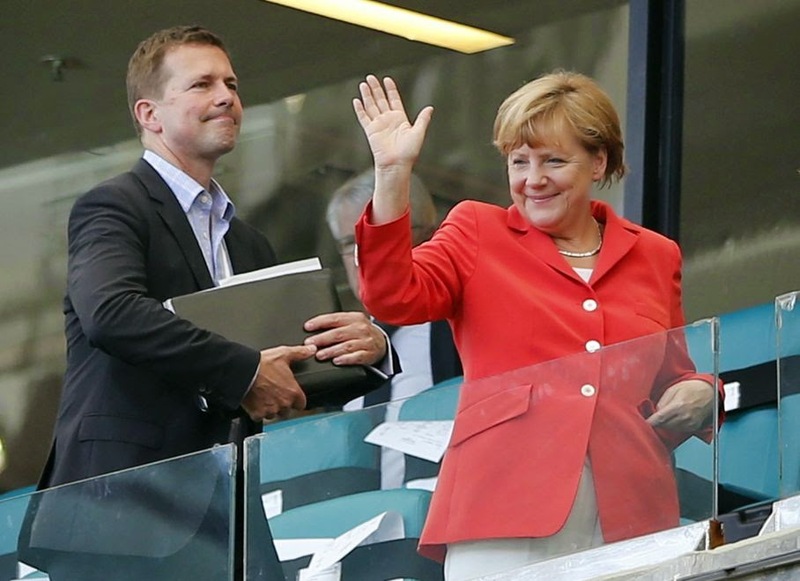 With Chancellor Angela Merkel supporting in the stands - and later congratulating them in the locker room - the German team celebrated its 100th World Cup match with a rousing victory. "After 20 minutes, we looked up at the clock and thought it was going to be a long day," Mueller said. "But we got into the match very well and when you lead by 2-0 in this heat and then even get the third, it was all over." What must be worrying for Germany's opponents is the apparent ease with which Loew's lineup disposed of the fourth-ranked team in the world. Germany next faces Ghana on June 21 and the United States on June 26. 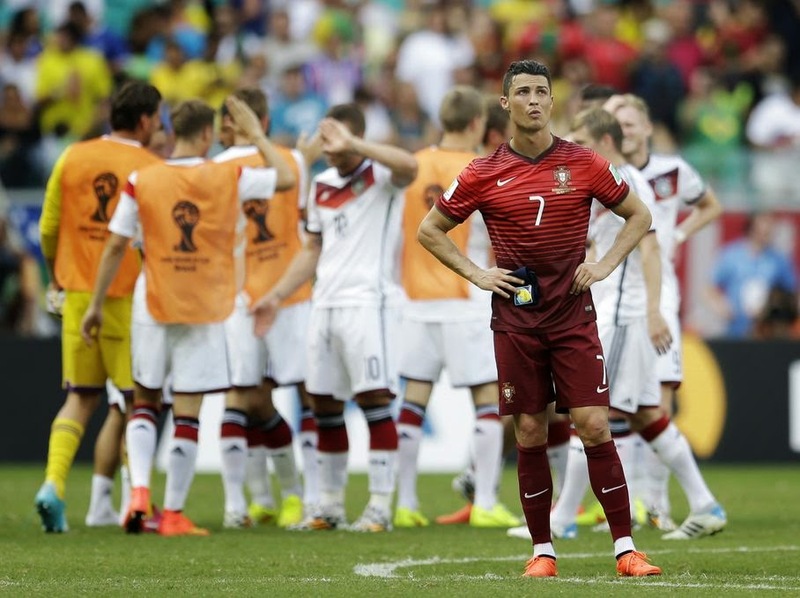 Portugal is becoming Germany's favorite opponent to beat up on in major tournaments. Germany won their 2006 World Cup third-place match 3-1, won 3-2 at Euro 2008, then beat Portugal again 1-0 at the start of Euro 2012. But this was the most convincing win of them all. Loew said his team implemented his game plan very well, winning the ball in midfield and then quickly attacking. "The match was over in the first 45 minutes," Portugal Coach Paulo Bento said. "Germany controlled the ball and they surprised us with counterattacking. "They scored with great efficiency. They were not so superior as the result showed, and we made bad mistakes. We did not perform as we had expected." Portugal was already 2-0 down before Pepe was red carded in the 37th minute for apparently head-butting Mueller when the German player was sitting on the ground. Pepe had stuck his hand into Mueller's face and the German went down. "I got hit but after that I am not really sure what happened," Mueller said. "But whatever he did was uncalled for." After the opening penalty, Hummels doubled Germany's lead when he rose above Pepe and nodded in a well-timed header from a corner. Germany capitalized quickly on its one-man advantage when Mueller made it 3-0 just before the break when he stripped the ball from Bruno Alves and drilled in a low shot. Mueller completed the rout late in the second half, poking in from close range after Rui Patricio had fumbled a low cross from substitute Andre Schuerrle. He said the margin should have been bigger. "We should have used some of our chances better," Mueller said, adding that it was hard to play in midday heat and humidity.